Use the bait to protect any vegetables from slug and snail damage, including (but not limited to): artichokes, asparagus, beans, beets, blackeyed peas, broccoli, Brussels sprouts, cabbage, cantaloupe, carrots, cauliflower, corn, cucumbers, eggplants, garlic, lettuce, onions, peas, peppers, potatoes, radishes, rutabagas, spinach, squash, Swiss chard, tomatoes and turnips. Scatter the bait around the perimeter of the vegetable plot at the rate of ½-1 lb per 1,000 sq ft, or for smaller areas, 0.15 oz or 1 level teaspoon per square yard, to provide a protective "barrier" for slugs and snails entering the garden plot. 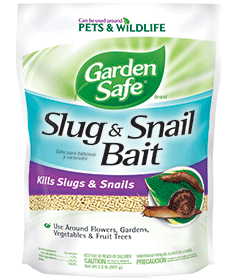 If slugs or snails are inside the rows, then scatter the bait on the soil around the base of the plants and between the rows.